Evidence leaves a lot of evidence that he is a force to be reckoned with in the rap game. True hip-hop can be defined by the ear of the listener. Some may say it has revived itself as of late with J. Cole, Wale, Drake and Kendrick Lamar, among others. Others will say that the age of true hip-hop has come and gone. But there are rappers celebrated by fans and critics alike who still make great music and still produce good hip-hop, such as Nas, Jay-Z, and Raekwon. They still record and release great music as if they never will retire. They are true rappers and artists who respect the craft of hip hop so much. Then there are rappers, such as Tech Nyne, Royce Da 5'9 and Common who are regarded by many as great rappers, but still overlooked by a lot as well. In hearing Cats & Dogs, I became instantly convinced that Evidence, originally from Dilated Peoples, should also be in this group, not just as a rapper, but also as a respected artist in the hip-hop game who won a Grammy producing for Kanye West. He's such a good artist, that Cats & Dogs is a must hear for anybody who is a hip hop fan. Even those who like 'Lil Wayne, Lil B or Gucci Mane will instantly give Evidence credit. Cats & Dogs provides the lyrics and charisma of a highly skilled MC. The first quarter of the album sets the tone with heavy samples, dark beats, a great overall sound and great lyrics. "The Red Carpet Treatment", featuring Raekwon and Rass Kass, is easily one of the albums standouts and "It Wasn't Me" is when it becomes clear that Evidence has an album worth listening to. The second quarter of the album features dope cuts like "I Don't Need Love" and "Fame" featuring Prodigy from Mobb Deep. The second half of the album also has great tracks such as "Crash", "Falling Down" and "Well Runs Down" with Krondon. But the best track on the album is "James Hendrix", an obvious allusion to the late great Jimi Hendrix, which sounds like pure hip-hop in its art form. Evidence is a rapper many will overlook, and this album is defiantly one of the best of the year. No, you won’t find any singles that are looking or even sniffing for airplay. You won’t even find a track that you will bounce to, club to, even socialize to. But, if you’re looking for true hip-hop in its essence, then you get Evidence and get his album. As soon as I heard the first few tracks, I got the whole picture: Evidence is dope. In fact, Evidence is better than 70% of the average fan's favorite rapper. But he won’t get that respect even though if they heard him they would. Yes there are the J. Cole’s and Nas’s and Eminem’s, but they are mainstream artists and have an obligation to sell records. Evidence and this album are for true hip-hop fans, those who love Mobb Deep's The Infamous or The Lox. This album won’t appeal to younger fans, but it will appeal to those hip-hop heads. 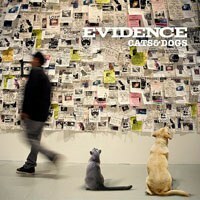 Evidence won’t have the copies flying off the shelf or cause internet hysteria anytime soon, but he can deliver a thoughtful and interesting album in Cats & Dogs.